The Chuckolator is a boss in the game Mario & Luigi: Superstar Saga. It was created out of Chuckola Cola by Bubbles, the founder of the Chuckola Cola Company, to protect his Chuckola Reserve, which he had been working on for 1,000 years. The Chuckolator is a large, red creature with black eyes and two bottle cap-like objects below its head and body, and its arms can take on different forms such as a rifle or a sword. Because Bubbles is very overprotective of his reserve, he sets the monster out on Mario and Luigi in an attempt to stop them from destroying or stealing it. The Mario Bros. must then engage in battle with the Chuckolator. It starts out with a shield, which protects it from hammer attacks. 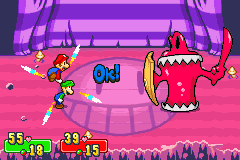 The Bros. must destroy this shield, as the Chuckolator is extremely resistant to jump attacks. Chuckolator can attack by shooting bubbles of soda from its rifle-like right arm, which must be jumped over, or by sending long snake-like soda monsters with slashes from its sword-wielding left arm, which must be Hammered. After repeated hammer attacks, the shield is destroyed and the boss is forced to fight without the shield. However, in this form, it can use both of the above attacking methods multiple times in one turn. After enough damage is dealt, the Chuckolator collapses into a smaller form. In this form, its only attack is a ramming attack (biting attack in the remake) that may poison the Mario Bros. Also, Bubbles comes after every turn and tells jokes to it, restoring up to 40 of its HP. Gerane Konti Laughing Conti, a pun of "Romanée-Conti"
Spanish Refrestruo Pun of refresco (soda) and monstruo (monster). French Soda Hilaro From hilare (merry). Gēgēníkāngdì From the Japanese name. Chuckolator is similar to Bundt & Raspberry, the cake boss on Super Mario RPG: Legend of the Seven Stars; both are a type of food turned into a monster, both shrink down to a smaller form after taking enough damage, both have slightly different battle styles from normal battles, and both are eaten/drank by the people who wanted/needed it. The only notable difference is that Bundt & Raspberry's sentience/turning into a monster was completely accidental (with Chef Torte being completely unaware of it until after his apprentice attempts to warn him twice), while the Chuckolator's sentience/being turned into a monster was implied to be deliberate on Bubbles' part. Chuckolator appears to be a loose reference to the T-1000 android from Terminator 2: Judgment Day, having similar abilities and a name that references the movie series. This page was last edited on April 7, 2019, at 00:36.